The government is calling for proposals from interested parties to enter into a business venture with the national carrier SriLankan Airlines, Prime Minister Ranil Wickremesinghe said. The Finance Ministry has already been instructed to call for expressions of interest for investment in the national carrier or enter into a partnership. The national airline has accumulated debt to the tune of $ 3.5 billion (Rs. 460 billion), an unbearable burden to the country’s economy, he said. “If we don’t solve the issue of debt in SriLankan Airlines now, the airline will go bankrupt, the country’s economy will collapse, and our tourism sector will also collapse. 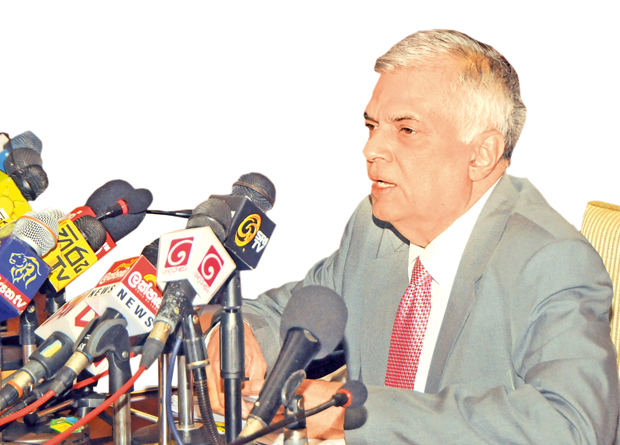 This should not be allowed to happen,” Prime Minister Wickremesinghe said. Three papers were passed by the Cabinet regarding the management of SriLankan Airlines; one is to enter into a partnership with the viable business partner. The options before the government in managing the situation was either to close down the business – which was not entertained, or to enter into a partnership to manage the airline, the Prime Minister said. The government will finance and manage the airline till October this year or until a viable partnership is established. The Finance Ministry has allocated $ 201 million for this purpose, while a further loan of $ 76 million has been obtained with the government signing as the guarantor. To minimise future losses, SriLankan Airlines has also been instructed to explore the possibility of cancelling the order for four new aircraft. “We have been informed that the manufacturing of the aircraft has not yet begun, therefore we have asked the airline to see if we can cancel the order,” he said. Special Assignments Minister Dr. Sarath Amunugama said the government is looking for a large scale airline operator to enter into partnership to support and manage SriLankan Airlines. Criticising the past government’s decision to terminate the agreement with Emirates, the minister said they are looking for a business partner of similar capacity. Amunugama also assured that that no SriLankan employee would lose their jobs in the restructuring process. The Prime Minister also highlighted that this is one of the measures taken by the government to ensure that the country’s economy averts any possible crisis situation in the future. The government is also planning to establish a separate office in Parliament to deal with all matters relating to state finance, Prime Minister Wickremesinghe said adding that a draft bill has been prepared to enable Parliament to gain more control and monitor power on all state financial matters. “To prevent issues such as SriLankan Airlines from arising in the future we have also drafted an Audit bill. But to manage already existing issues we will have to go into a partnership,” Wickremesinghe said.